Thousands of replacement window parts in stock or available. Find a window replacement part enter the part number off the hardware that you need you can also submit a window part to be identified. 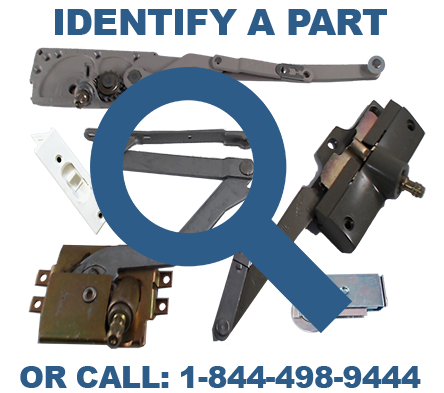 We carry parts for awning and jalousie windows, casements, double or single hung, sliding windows, screen door parts, storm screens and truth hardware. Thousands of window replacement parts in our inventory and we ship all of our parts out nationwide via fast USPS shipping just search for a part above or you can also submit a picture of the hardware below we cover many different types of parts ranging from balancers, operators, tilt latches, pivot bars for both hard to locate or obsolete items our team can find out which type you require in order to ship you out the right part you need, please fill out a form below if you are not sure of the replacement part that your job requires. We ship out replacement parts all over the USA whether you are a homeowner, a handyman, landlord, contractor or business owner. Not sure what window replacement part you need? Just send us in a picture or give us a call.